I am thrilled beyond words that 90s fashion is sneaking back in. I’ve been searching the vintage sections of eBay recently for some great 90s dresses that are amazing. Today I want to talk about some of the fancier stuff I saw. I won’t go into gowns, but cocktail dresses, work appropriate dresses, etc. 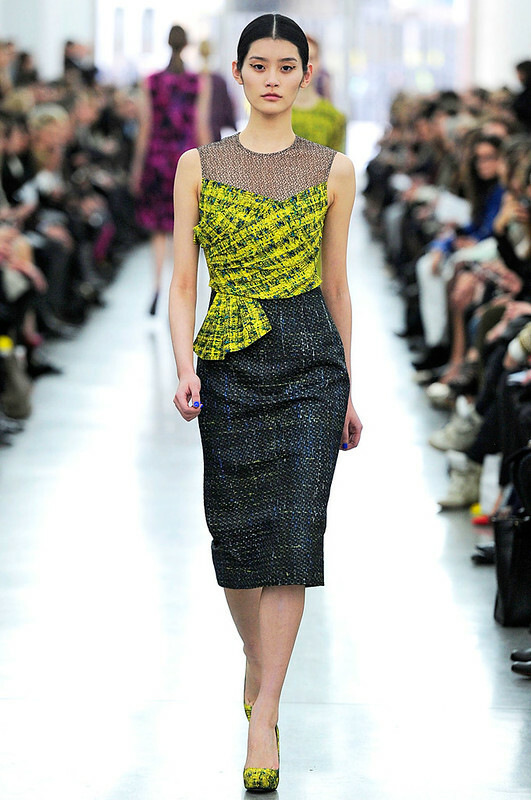 This look is by Jill Sander. I love this top, but I don’t think I could wear it in the same way, due to not weighing <100lbs. The skirt would be pretty versatile as well as the shoes, but overall I thought it was styled well. Less is definitely more, here. Confession: I would murder someone for this dress. This dress by Erdum is probably my favorite of all of the looks I’m going to show you. I’m not entirely sure I could pull off that color, but who the hell cares. Gaaah. Oh, Valentino. Your romantic looks just… sigh. This one is correct. I almost wish the shoes were a different texture instead of what looks like plain ‘ol leather… maybe they tried patent and it failed. 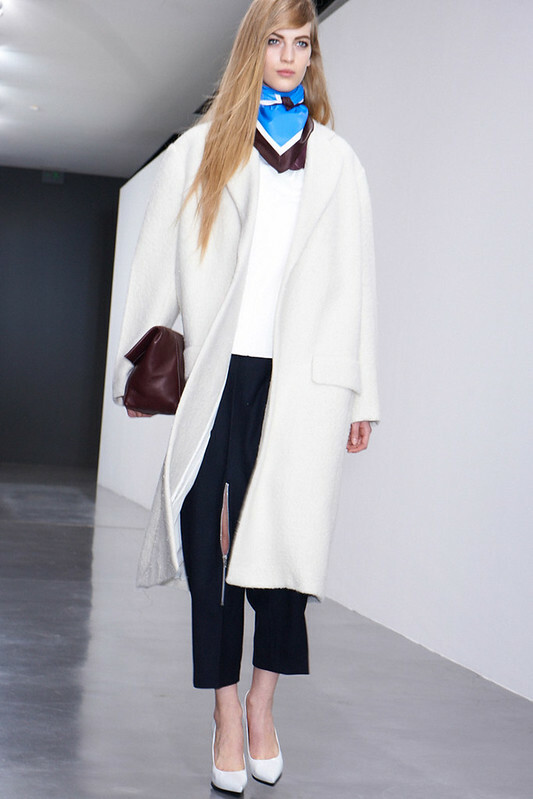 This first look, from Céline, is perfect. I would wear this out any day…Maybe not the white heels, but you never know. I might need an oversize coat this fall. This look is by Band of Horses. I absolutely need these pants. 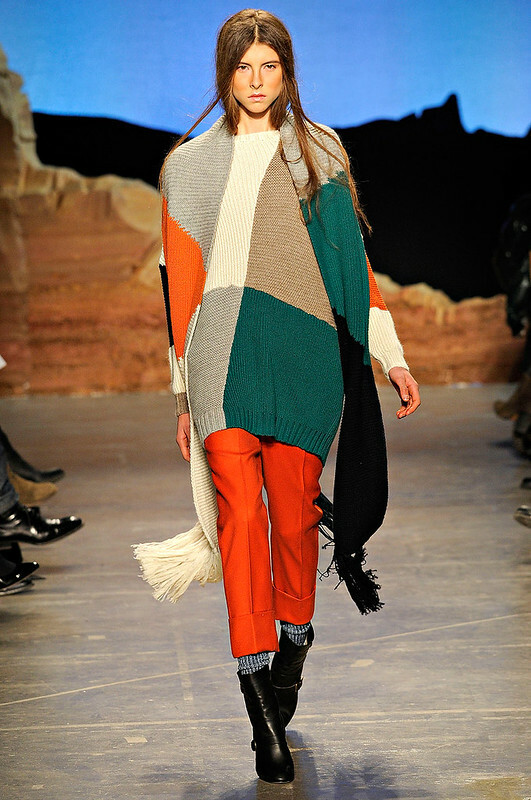 I would take the sweater/scarf, but the pants. Ahhhh! And pair with the booties with the amazing wool socks? I’m dying. Dead. I cannot bear not having this outfit. Drooooooool. This look is by Rodarte. I want it all. I love the shoes; I could wear them with probably half the things I own. The dress is incredibly versatile. 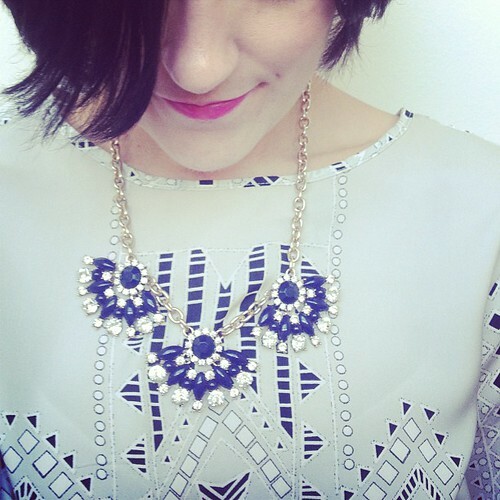 I could wear it to work or to a wedding, depending on how I styled it. I CAN HAS? This equestrian look by Altuzarra is amazing. The boots really add the edge that this look needs, despite the cargo pants. I probably wouldn’t wear the pants (any kind of puffy does not work well with my hips), but I would wear everything else. Stay tuned… next time I’ll look at some fancier dresses.